For The Love Of Art: A New Beginning As a Pinquette! A New Beginning As a Pinquette! Good morning ladies and fellow crafters. Take a look around, do you see anything new? Come on my announcement is here for all to see. Didn't see it yet? Look at the right side bar. There ya go, lol. I am thrilled to now officially announce that I have joined an outstanding group of overly talented ladies. After being on another Design Team for over a year, I decided I needed a change. Don't get me wrong, I enjoyed my time on the other team and learned a lot but I was thrilled when the opportunity arose to apply for a position with the Pinque Peacocks owned by Jessica Shelton-Buffa a fellow crafter with an amazing on-line store. She and my fellow DT sisters welcomed me with open arms. I am so lucky to be with some old friends and look forward to making some new ones on this Team. Wait until you see the talent over here. O My Gosh!!! This is just so exciting for me. For those of you who have come to my "home" for the first time let me fill you in on a few facts. I am a wife for (almost) 40 years, mother to 5 grown adults ( there is a set of twin ladies in there) and Mema to the most beautiful, talented, awe inspiring 8 grandchildren (3 girls, 5 boys).I retired from nursing (I was a Labor & Delivery room R.N.) when my second child was born. ( Thank God 'cuz the twins followed about 2 1/2 years later. I sewed dance costumes, prom dresses etc to help pay for extra activities for our growing family. My therapy was to take all kinds of craft classes, tole painting, ceramics (my least favorite medium BTW), advanced sewing classes, both Copic Certification classes, flower arranging etc, etc. As you can see I love crafts. These skills have helped me to work as a floral designer for the last 12 years and boy was that handy with weddings, showers, christenings and all kinds of parties. I recently retired since my back will no longer let me, lol. Okay that's enough about me. This new DT has given me the opportunity to create what I want, when I want and in whatever medium I choose. The Pinque Peacock has THE most fabulous products from flowers, to stick pins to fabric covered buttons as well as gorgeous stretch bracelets.You can find their products HERE This link takes you directly to the product page. Click on a picture and feast your eyes on the yumminess, lol. I thought I would share a card I made with you today. Hey, this is a crafting blog so I don't want to disappoint you, lol. Before I share this please envision how great this would be with a PP flower. I do not have any in yet but rest assured future projects will be loaded with goodies! My base for this card is from My Minds' Eye Life Stories "Roses" pattern. 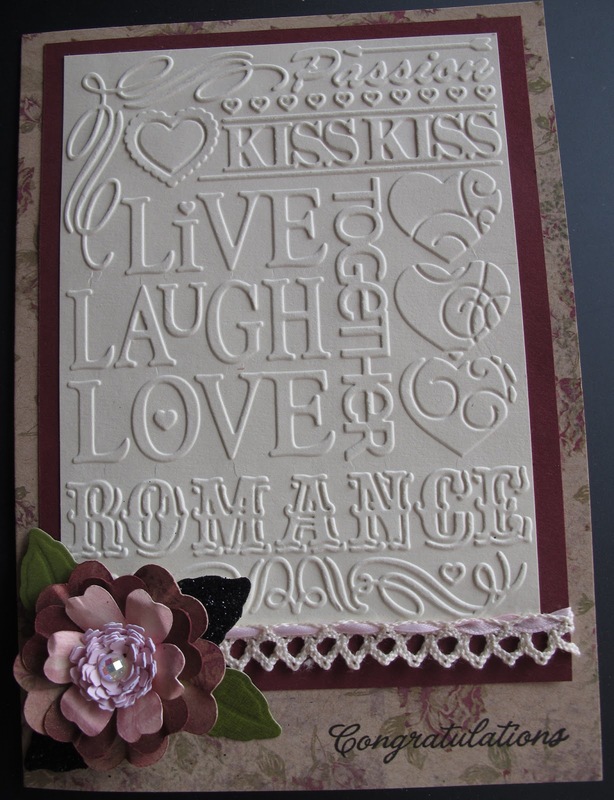 I grabbed a piece of good quality cream card stock and embossed it with a cuttlebug folder. I found the heavier card stock gives a great embossing effect. Next up the flowers. I used Flower Shoppe to cut my flowers with the image on page 14. I also used a Spellbinders to cut the leaves. I wanted to add some "Drama" to the card so some of the leaves are out of black glitter card stock. I have these great rhinestones and this one was perfect for the card. I have a lot of little pieces of lace from former projects (I don't throw anything out, lol. Glad I didn't!). I just wove a narrow pink satin ribbon through the lace. Stamped a nice sentiment and, Voila, I have a great card. I'll probably use this for a wedding. There you have it, my first post as a Pinquette! I hope you have enjoyed my Bio as well as my first project. Be sure to come back on Friday as that is the start of our 3 Day Irish Blog Hop. You'll all be dancing the jig for sure!!! Have a fabulous week my lovelies. Congradulations Mary!!! I am very excited for you! Can't wait to see all the upcoming projects!! Have fun and stay in touch! Welcome Mary to the Pinque Peacock! I can not tell you how very excited I am to have one of my former DT sisters become a CURRENT DT sister! You have such talent ...and this BEAUTIFUL card you shared today shows that so well! I am a sucker for embossing! LOVE YOUR CARD! Mary, your card is magnificent. 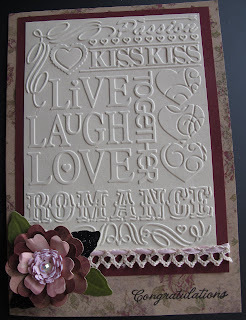 I LOVE, LOVE, LOVE that embossing! Your bio post was so super fun to read. I am happy you have joined us as a Pinquette and am excited to follow you along as you create what you want, when you want!